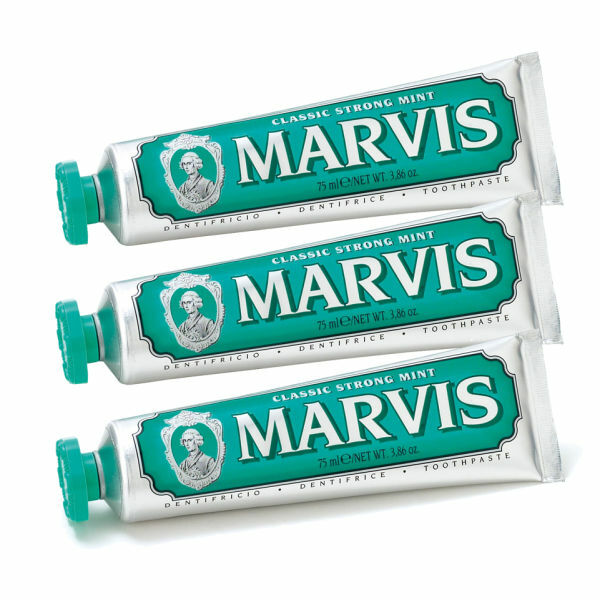 Transform your smile and teeth-cleaning ritual with the Classic Strong Mint Toothpaste Bundle from luxury Italian toothpaste brand Marvis; a trio of refreshing, creamy toothpastes in cooling mint flavour that whiten and protect teeth while freshening breath. Developed to keep teeth and gums healthy whilst preventing decay, the toothpaste utilises a gentle Xylitol and Sorbitan-based formula to cleanse and condition the teeth without irritation. Experience luxurious and contemporary oral hygiene. Glycerin, Aluminum Hydroxide, Water, Silica, Aroma (Flavor), Cellulose Gum, Titanium Dioxide, Sodium Lauryl Sulfate, Sodium Saccharin, Sodium Citrate, Citric Acid, Eugenol, Limonene, Benzyl Alcohol.